Last year, a former hockey player at Northeastern announced that she was doing something that no one had ever done; she would be paying women in the United States to play hockey. Dani Rylan loves hockey, she wants others to love women’s hockey and she has plenty of ambition to go with her love of the sport. Her announcement showed that her ambition might not have been misplaced. Prior to making the announcement Rylan had convinced a significant number of investors and sponsors that the world did in fact want to see women play hockey. Her professional league would be called the National Women’s Hockey League (NWHL) and would consist of 4 teams, the Boston Pride, Buffalo Beauts, Connecticut Whale and New York Riveters. Its inaugural game sold-out, and its inaugural season ended on March 12, 2016, with the Pride winning the Isobel Cup. On the surface, things seem to be going well for the NWHL, but below the ice things seem to be jeopardizing the League’s viability. In April, Mike Moran, an NWHL investor and former executive, sued the League and Rylan (the current Commissioner) for $650,000 for breach of contract, unpaid wages, damages and attorney’s fees. Not good. Then yesterday, an email was leaked that accused Rylan and others of being less than transparent in their dealings and that threatened to file lawsuits and a complaint with the Federal Trade Commission if the NWHL did not repay $25,000 to disgruntled investors. Also not good. Any of these legal actions (whether the League could successfully defend itself against them or not) has the potential to derail the fledgling league. Instead of focusing on media deals, marketing strategies, investors and other things that will secure its growth and sustainability; the small League is forced to focus its time and money on the unaffordable costs of litigation and bad publicity. In these precious early years, all energy needs to be placed on positive movement or failure is imminent. So unless the NWHL can limit the distractions, it is headed for the same defunct ending that other women’s leagues have met. And although the NWHL is still small in stature, we just can’t afford that. Despite having international stars like Serena Williams and Ronda Rousey, women’s professional sports continue to lag behind men’s in viewership, revenue and overall acceptance. In 2016, women still have to defend their rights and fight for the opportunities to play professional and amateur sports and to have meaningful roles in the sports world as a whole. While women in sports have come a long way, it’s clear that there’s still so far to go. That’s precisely why we need the NWHL to do the very opposite of fail. As women and men work hard to build on the legitimacy of women’s sports, another failed league would only be a distraction from, hindrance to the progress that has been made. A failed NWHL would fuel the naysayers who argue that the world doesn’t want to see female professional athletes and that women play an inferior level of sports. A failed NWHL would make another little girl question whether the time she spends on the ice is really worth it. And a failed NWHL would discourage would-be investors from putting their money and support behind the next big push for women’s sports. We need the small league to help prove that female athletes are capable of drawing crowds and revenue, of being embraced by the public and of sustaining successful careers as professional athletes. To avoid failure, Rylan and the other executives have to do more than be passionate about hockey and women’s sports. They have to combine that passion with transparency; a legitimate knowledge and practice of business and marketing; creativity; and tenacity. The nature of the claims against Rylan and the NWHL suggest that the organization might be suffering in the those areas. But the NWHL wouldn’t be the first organization to struggle with sports business. All start-up leagues and businesses contend with growing pains that are contingent upon leaders’ abilities to manage and market their products. Unlike start-up men’s leagues, however, start-up women’s leagues must also contend with outside forces that fight against strong, athletic women. To find and sustain success, those added obstacles dictate that women’s leagues assemble teams of executives who have experience building start-ups, who are well-connecting and successful in marketers, who know how to manage and grow budgets and who really believe in the cause. Unfortunately, a number of women’s leagues, like the Women’s Professional Soccer league, the Women’s National Basketball Association and the Women’s Western Volleyball League have failed or struggle with assembling those teams. The NWHL can’t be one of those leagues. We need the NWHL to succeed. If Rylan and the NWHL need to go back to the drawing board and adjust the way they manage the League, then so be it. If they need new managers, hire them. If they need new strategies, develop them. But failure is not an option. Failure wouldn’t be as as financially catastrophic as the failure of the NBA or NFL, but failure here is about more than lost jobs and money. Failure for the NWHL equals lost hope and lost momentum for women in sports. And right now, in a time when so many are working so hard to fight for womens’ places in sports, we really can’t afford another failure, even a small one. 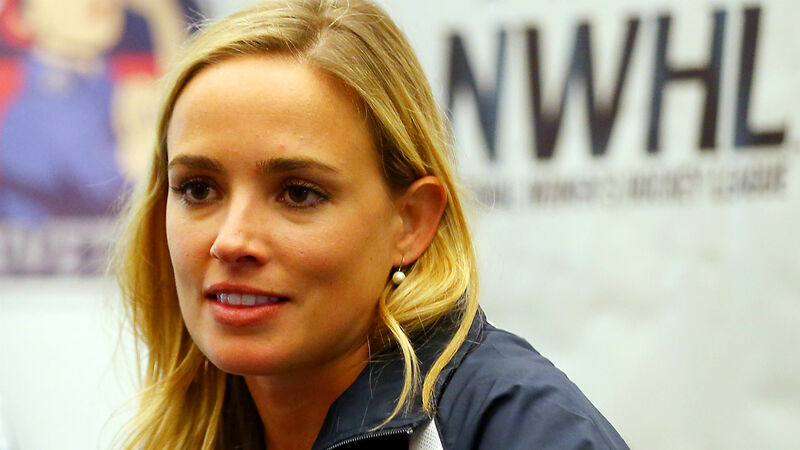 So what do you think the NWHL needs to do to succeed? Will failure really take a toll on women’s sports as a whole? Let us know what you think below and be sure to keep up with GladiatHers.com on Twitter, Instagram and Facebook. Let me first say that I’m not a fan of women sports but I do believe there is a need and a real place for women’s sports. The problem that I see with women’s sports league’s in particular is that none of the league’s can compare to the men’s league’s. The belief that we should not compare the games is a nice thought but is unrealistic, for the women’s sports to actually gain credibility and visibility the women’s league must go away and the women must step up and play in the men’s leagues, now in the beginning the men will dominate all the sports but as females start competing with the boys on all levels eventually the skill level would improve to the point where the women would have proved their credibility over an extended period time, otherwise the comparison will never end. Thanks @pba257! I definitely don’t think that women need to compete in men’s leagues to establish legitimacy. A woman’s ability to beat other women is just as valid as a man’s ability to beat other men. The world has shown that it appreciates women’s competition. Look at women’s soccer, track & field, gymnastics and tennis for example.